The EUROCOM Panther 5 Mobile Supercomputer now supports NVIDIA GeForce GTX 980M graphics in SLI. Eurocom customers can now combine NVIDIA GeForce GTX 980M or 970M in single and SLI with 32 GB DDR3-1600 memory, Intel Core i7 Extreme Processors and up to 8 TB of high capacity storage via four drives for unbeatable performance and capability. 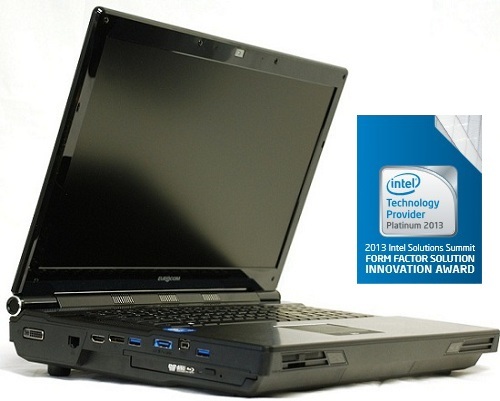 Eurocom systems are custom built and fully upgradeable at time of purchase or well after, putting Eurocom customers in the driver’s seat of their high performance laptop. At Eurocom, the customer is king. “Our customers will welcome the incredible performance of the NVIDIA GeForce GTX 980M’s 1536 CUDA cores, running at 1038 MHz and 8 GB of GDDR5 memory running at 2500 MHz inside their fully upgradeable EUROCOM Panther 5 Mobile Supercomputer” Mark Bialic, Eurocom President. The EUROCOM Panther 5 supports both NVIDIA GeForce GTX 980M (8GB DDR5) or GTX 970M (6GB DDR5) graphics for unbeatable performance and raw power. The NVIDIA GeForce GTX 980M’s 1536 CUDA cores, running at 1038 MHz and 8 GB of GDDR5 memory running at 2500 MHz offers 50% faster performance than the previous generation NVIDIA GeForce GTX 880M.